Get involved - keep up to speed with the latest football tips, tricks and news right here on the coaches blog. 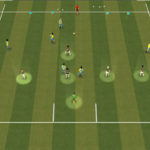 Football Skill of defending when outnumbered FREE E book This is a progression to the FREE e Book on the Technique of defending when outnumbered We now move on from the technical practice to the skill practice and create fast moving, game like scenarios where the attackers are breaking quickly, counter attacking and trying to score goals and the defenders are outnumbered and have to delay the attack and try and buy time for team mates to recover back quickly, to get organised and stop the attackers scoring. Soccer Training Drills that help players to understand and practice in game related situations the technique and skill of running with the ball, are really important to help players develop and improve this vital skill that can really carry attacks quickly and effectively to the opposition. Soccer coaching to develop and improve ball control and passing skills. Access hundreds of soccer coaching videos designed by UEFA A licensed coaches. All the sessions are searchable by topic, age and ability. 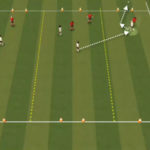 Watch the video to see a preview of the 60+ ball control and passing soccer coaching videos available on the site. 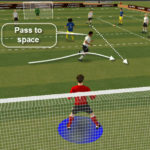 Soccer Training sessions to develop and improve shooting and finishing. 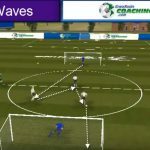 Over 50 soccer training videos specifically focussed on helping coaches improve their players shooting and finishing skills. When I was a young kid in London, the first professional game I ever saw was Fulham v Man Utd at Craven cottage. In those days the kids got passed down to the front of the crowd and I ended up pressed against the perimeter fence, literally a yard from the pitch. That was the first time I fell in love. The object of my love, was a skinny lad playing for Man Utd, he had unbelievable dribbling skills. could turn on a sixpence, beat players for fun. Stop in a second and then accelerate like a Ferrari. He was the best dribbler I have ever seen. His name - George Best.